Most people not under the sway of the white supremacists in the White House think humanitarian aid to starving people is a good thing. Yemen, for instance, where 12 million people in danger of starvation due to the U.S. sponsored Saudi war could be saved if aid could get through to them. But, in the hands of imperialist countries, aid is a weapon for control. The Trump/Pence regime, with Mike Pence as the bully on the ground, is using "humanitarian" food aid to gain control of Venezuela. 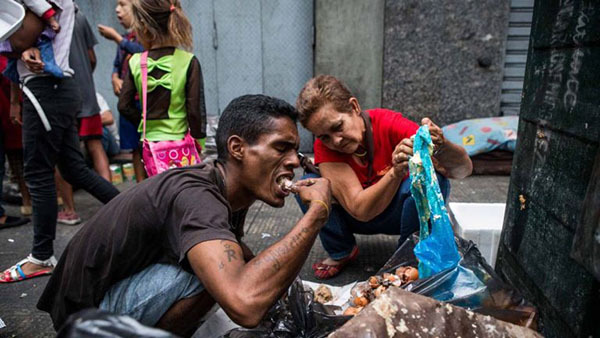 ALL THE WHILE, over the last two years, U.S. sanctions and theft of Venezuelan oil receipts are starving Venezuela. The operation is also designed to foment regime change in Venezuela — which is why much of the international aid community wants nothing to do with it. UN Humanitarian operations are supposed to be neutral. That's why the International Committee of the Red Cross, United Nations agencies and other relief organizations have refused to collaborate with the U.S. and its allies in the Venezuelan opposition who are trying to force President Nicolás Maduro from power. Under "America First," there is NO chance that the Trump/Pence regime is acting in the interests of humanity.